A few years back, a coworker and I wrote a couple of entries for the Encyclopedia of Survey Research on the topics of “sugging” and “frugging”. These are highly unethical practices where an organization attempts to sell a product or fundraise in a manner that uses market research as a cover. I got something in the mail yesterday that is such a spectacular simultaneous example of both that it seems like a good thing to share it. So without further ado, I present to you a Guide to Identify Suggers and Fruggers. Clue #1. They name-drop people who have nothing to do with the research. In this case, the organization included the names of my congresswoman and senators prominently on the envelope, in a way that implies their involvement. They aren’t involved. Clue #2. They ignore statistics in favor of exposure. 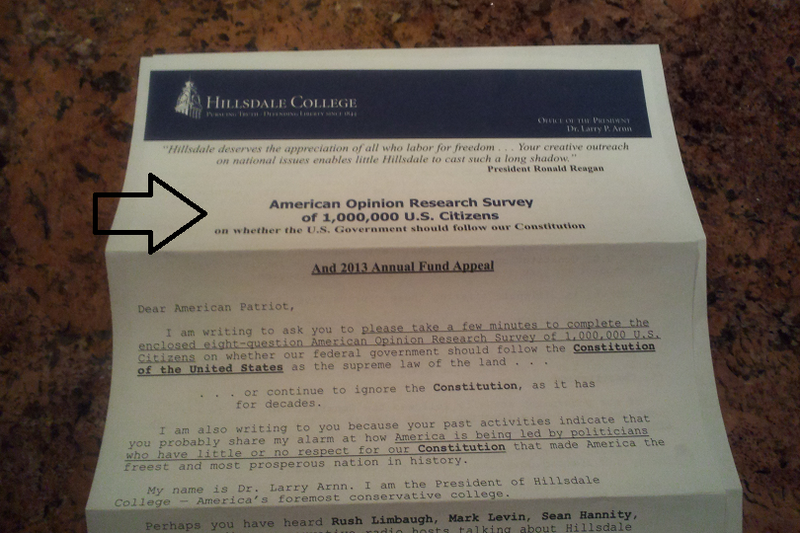 In this case, the organization states that they are conducting a survey of 1,000,000 Americans. Other than a few major government surveys, there’s no legitimate reason to conduct 1,000,000 surveys. You can do a survey that accomplishes almost anything you’d need with 1% of that amount. 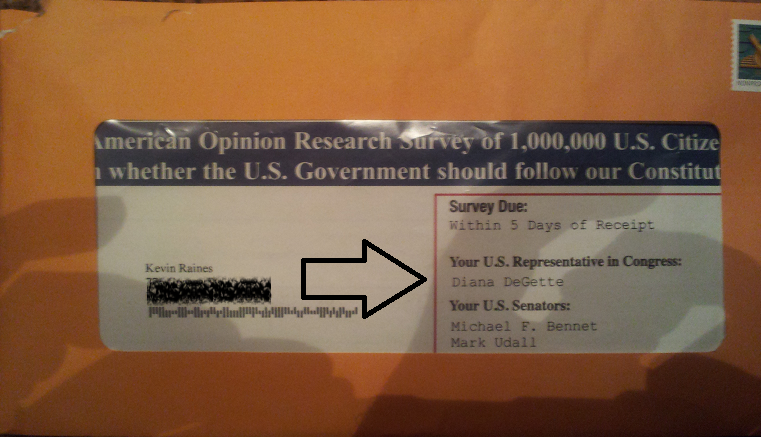 So why is this organization absorbing such a large cost for mailing these “surveys”? 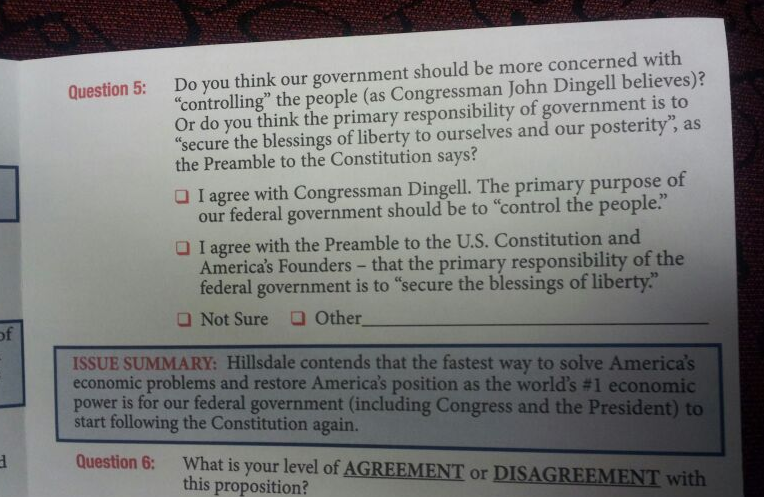 Well, it’s because it’s not a survey – it’s a sales and fundraising advertisement. Clue #3. They ignore proper statistical sampling. 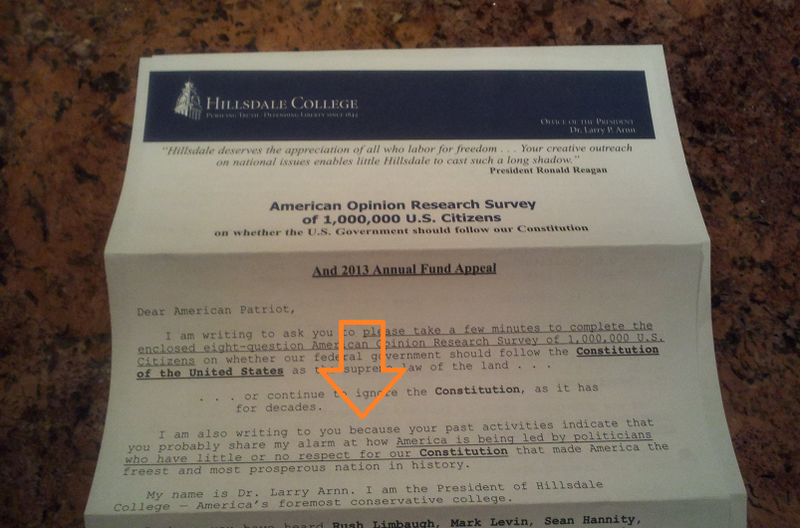 I received this mailing because “my past activities indicate that I probably share his alarm …” So this mailing only went to people who are likely to agree with the views of the organization sending the mailing. And on a personal note, what past activities did I do to warrant getting this mailing? 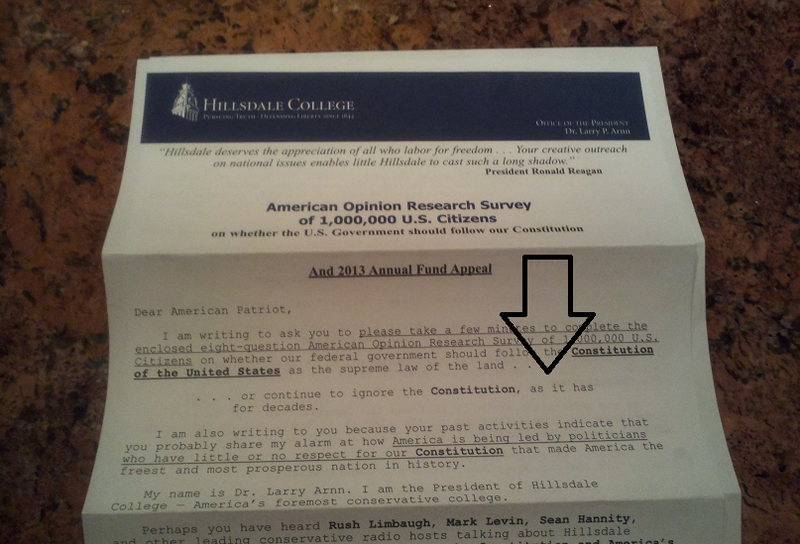 I suspect that being an unaffiliated voter got me on their list. Now, I like the Constitution. I’m a big fan of the Constitution. But these people frighten me. Clue #4. The language is not neutral. In this case, the organization blatantly tells you their position and leaves no doubt about how they plan to use the results to support that position. Clue #5. They tell you how to answer each survey question. Okay, this is not typical. Usually organizations are a bit more savvy than this, but here goes. This organization asks a “survey” question and then informs you about the answer that they want. They more or less tell you the answer that they want. Seriously? Clue #6. They ask biased questions. As an expert in survey design with over 20 years of experience, my instincts tell me that perhaps this question is biased. Clue #7. 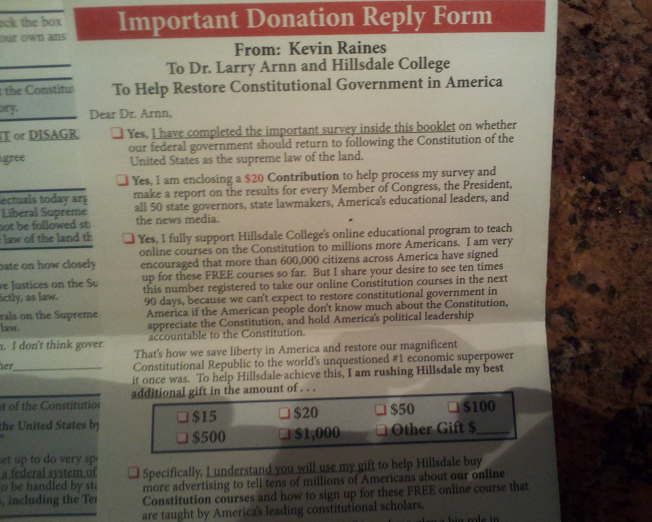 They ask for a donation (frugging). 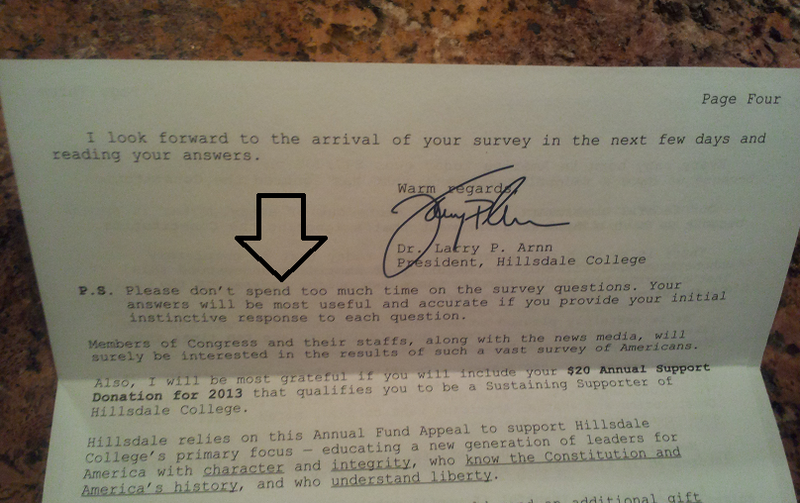 Typically, a frugging attempt will phrase a donation request as a survey question, and this organization is no exception. 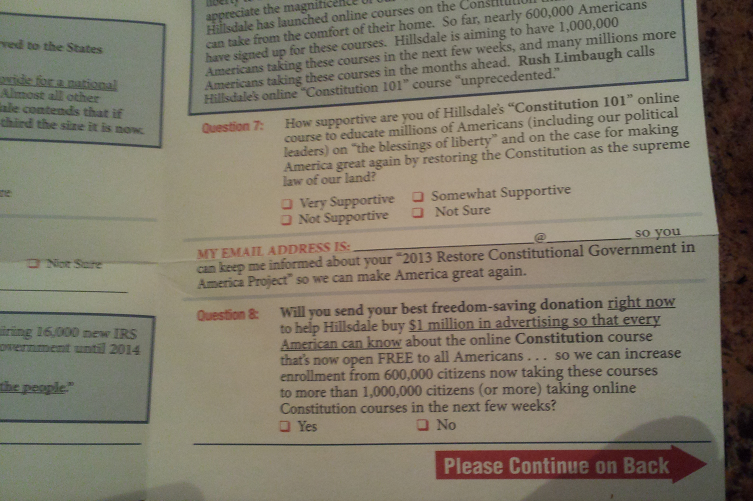 This particular organization goes a little further, including it in two “survey” questions and soliciting donations in no fewer than six different places in the mailing. Clue #8. They try to sell you something (sugging). Clue #9. They don’t really want your response if you don’t agree with them. 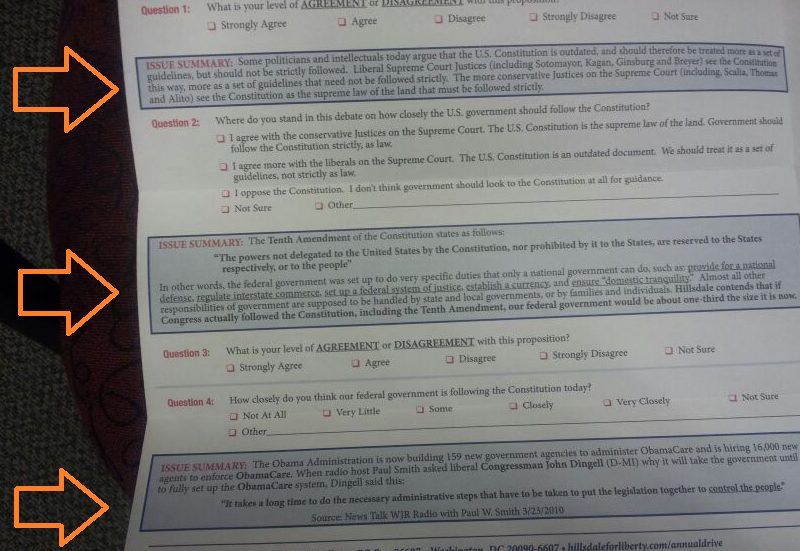 If you return this survey, you have expressed your opinion that you agree with their position. And that’s that. They don’t really care what you write. “Please don’t spend too much time on the survey questions”? Really? That’s kind of sad. As professional researchers, these types of sales and fundraising strategies are dismaying. They make the public more cautious and less trusting of legitimate research, and while most people will see through poorly constructed efforts like the one above, there will always be a few people who will complete the fake survey, which this organization will doubtless present as if it is legitimate, scientific research, further degrading the trust that our industry works so hard to develop. It’s unfortunate.